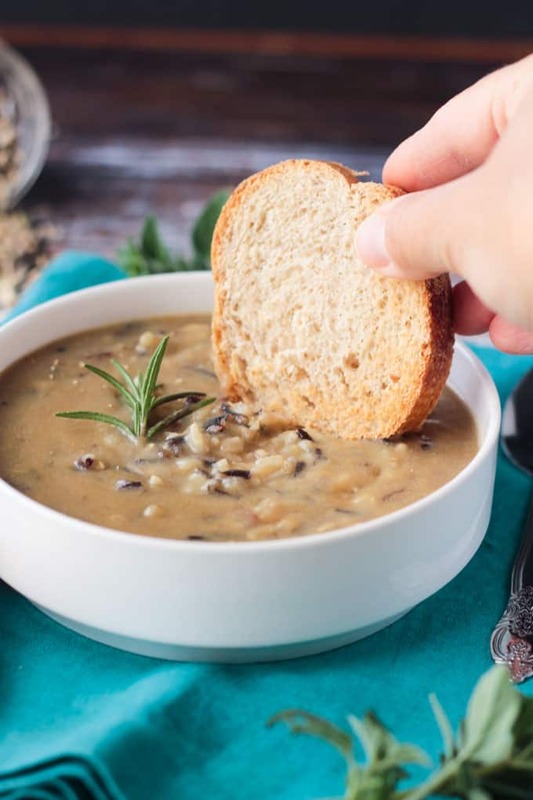 Creamy Leek and Wild Rice Soup – thick and creamy, yet delicate in flavor. This cozy soup is perfect all year round. 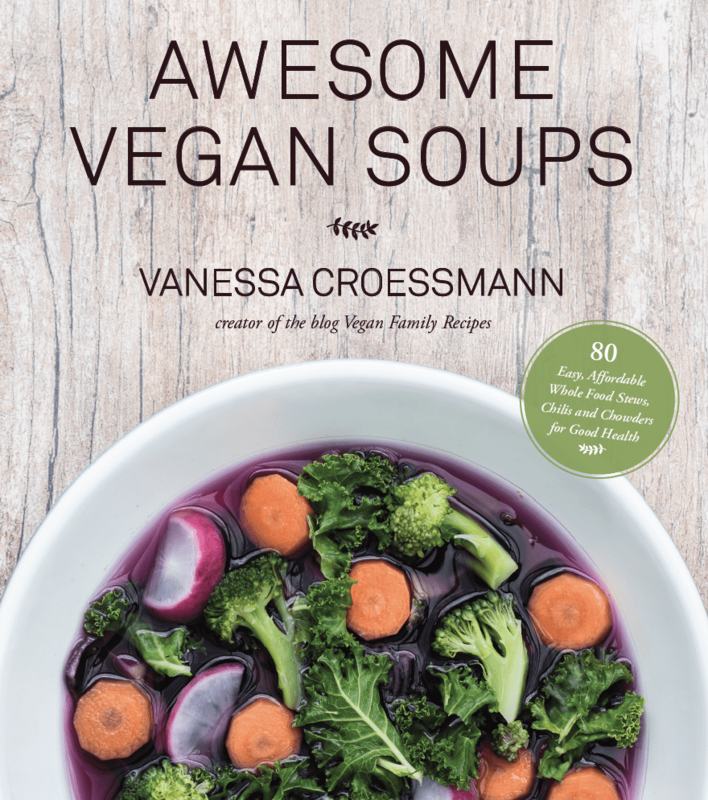 It comes from Vanessa Croessmann’s new cookbook, Awesome Vegan Soups: 80 Easy, Affordable Whole Food Stews, Chilis and Chowders for Good Health. It’s a keeper! For me, soup season is all year. I could eat it every day. Brothy, hearty, creamy, chunky, spicy, refreshing – I love them all! Which is why I’m so excited to tell you about this new cookbook today! 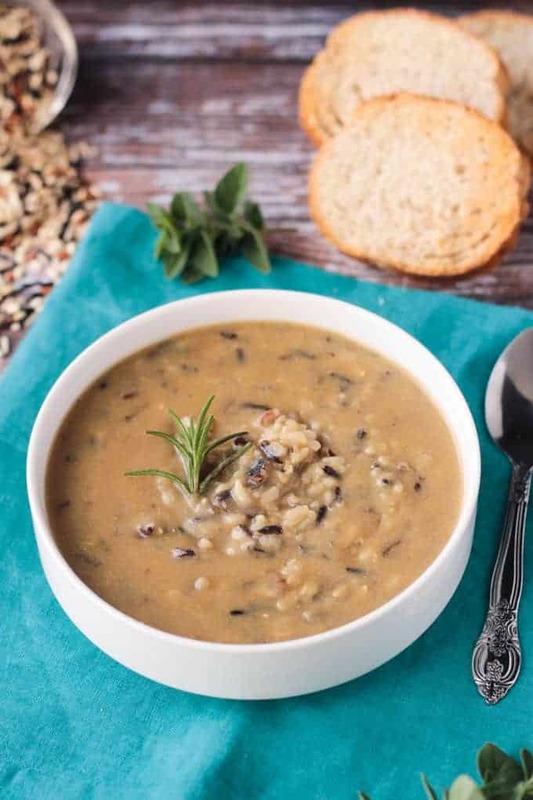 Not only will you get a full review of Vanessa Croessmann’s new book, Awesome Vegan Soups, but Vanessa is generously letting me share the recipe for her totally delicious Creamy Leek and Wild Rice Soup. Keep reading to get all the details! Vanessa is the voice, photographer, and recipe creator of the blog, Vegan Family Recipes. She is also a wife, and a mother to two young boys. 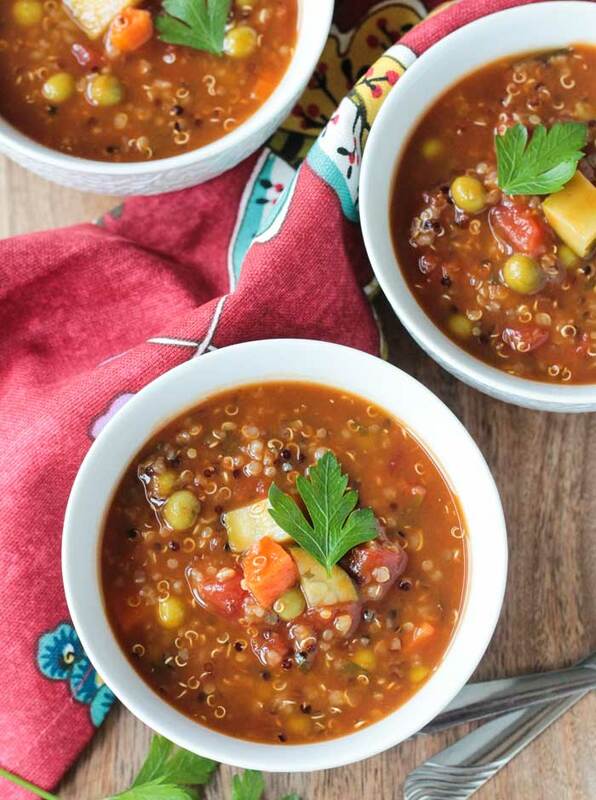 On her blog, she shares healthy plant based recipes that will please everyone in your family. I had the pleasure of meeting Vanessa (and Linda from Veganosity!) in the summer of 2016 when she was visiting family here in the midwest. She is just as sweet, friendly, and gorgeous in person that you would imagine her to be. The three of us had a great time munching on vegan food, sipping vegan drinks, and getting to know each other better. It was such a fun time! I am thrilled to be able to share Vanessa’s new book with you today. I have always loved her recipes – her Vegan Cauliflower Leek Casserole is a favorite of mine – and this book lived up to all of my expectations. 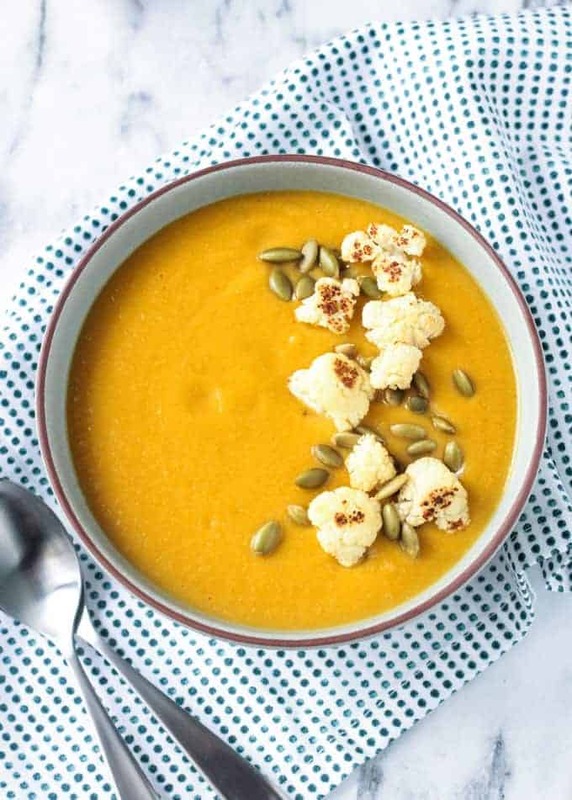 Not only did she create these 80 new soup recipes, but she did all of the beautiful photography herself too! She’s quite a talented lady! Awesome Vegan Soups is organized into four seasonal chapters, so you can cook with produce that is in season and affordable. Below are just some of the mouthwatering choices in each chapter and I can’t wait to try them all! Extras and Toppings: A bonus 5th chapter that includes recipes such as Vegan Sour Cream; Basil Walnut Pesto; Homemade Vegetable Broth Powder, Homemade Croutons. 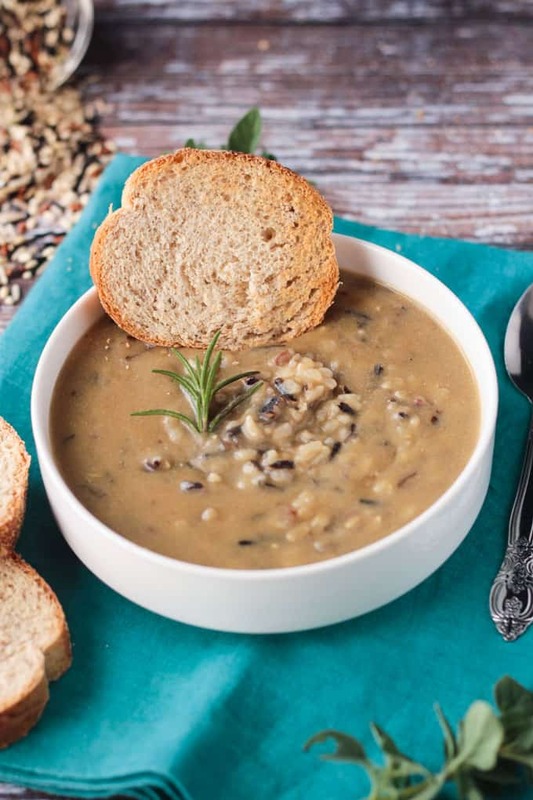 This Creamy Leek and Wild Rice Soup is so good, you guys! It’s super creamy and so easy to make. Just a few ingredients come together perfectly to make this light, yet filling, soup. Pair it with a slice of toasty bread to make it even more satisfying. I can also attest that leftovers are just as good! 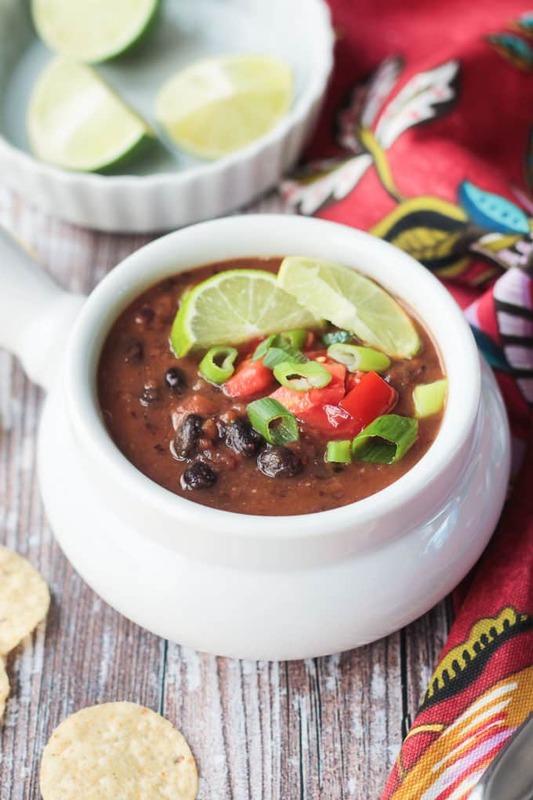 The flavors continue to meld – I seriously can’t get enough of this wild rice soup! 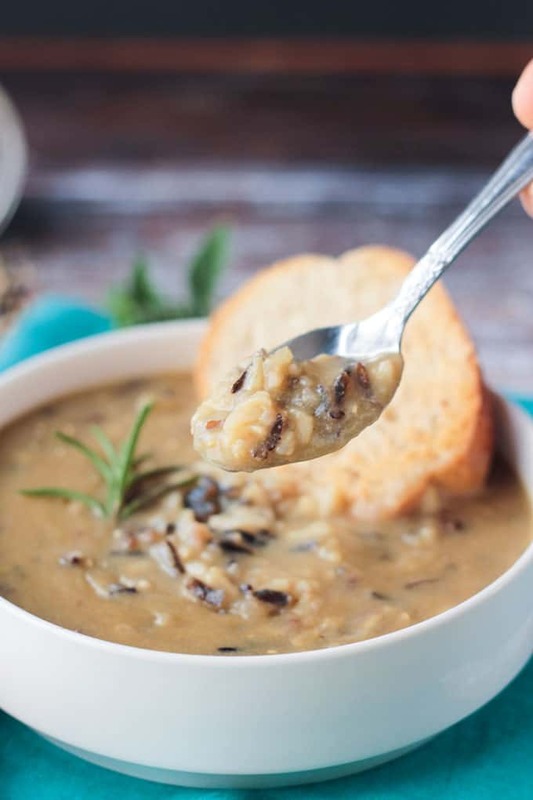 I hope you love this Creamy Leek and Wild Rice Soup as much as I do. If you try it, please come back and leave me a comment below with your feedback and rating. And don’t forget to pick up a copy of Awesome Vegan Soups so you can try all the other delicious soups too! Leeks are available from autumn until spring. Though this soup could be made at any time, it’s one I like to make in early spring. Rainy spring days really call for a bowl of creamy soup to cheer you up! Cut off the dark green leaves from your leeks. You can either throw these leaves away or keep them for later to make a broth. Chop the white part of the leeks into thin rings. The sliced leeks should weigh roughly 12 ounces (340g). Place the sliced leeks in a bowl of cold water. Rinse them thoroughly to remove any dirt. Drain the water from the bowl and set the leeks aside. Heat the olive oil in a large pot and add the minced garlic, leeks, potatoes, rosemary, and thyme. Cook everything in the pot over medium heat for 5 to 7 minutes, until the garlic becomes fragrant and the leeks become slightly limp. Add the vegetable broth and water and bring to a boil. Once the soup is boiling, reduce the heat and simmer for 20 minutes until the leeks and potatoes are tender. Puree the soup with an immersion blender, or in a blender in batches, until smooth. Add the milk and rice to the soup and bring to another boil. Reduce the heat and simmer, stirring often to prevent the rice from sticking to the bottom of the pot, for 20 to 30 minutes until the rice is tender. Season the soup with salt and pepper to taste. Serve the soup with a slice of bread, if you like. *Note from Veggie Inspired - The recipe calls for wild rice, but I used a wild rice blend. I believe this is what Vanessa used too based on the picture in her book. ~Nutrition facts calculated without garnishes. I made it a bit different. Instead of using the water with the broth I mixed it with 2 cups of soymilk and added cornstarch and water to thicken it before adding the rice because I love potatoes whole in my soup. My husband and I loved it! 🙂 Would recommend to try! So glad you liked it! Perfect to warm you up on these cold winter days! Looks so cozy and delicious! I need to check out Vanessa’s cookbook! Definitely check it out! It’s great! There’s something so comforting about a hot bowl of soup! This one looks so creamy and delicious! Yes, I definitely agree with that! Thanks, Sonali! I need more leeks in my life! I like them but just haven’t really used them much at home! This looks like a great place to start! For sure – you’ll love it! Thanks, Jennifer! I hope you get a chance to try it too! You’l love it. Thanks, Katie!